The housing inventory all over Santa Clara County was close to the lowest in the County’s recent history with January 2013 seeing just 852 homes on sale. The county had lowest number of listings in early 2000 with just 692 homes on sale. The inventory situation situation has steadily improved with more homes coming into the market given the rapid surge in demand and home prices. Sunnyvale’s 94087 zip code area is no exception. This is a hotly sought-after neighborhood and all categories of homes sell well within days as long as these are attractively and appropriately priced. Is This Your Opportunity To Sell? I present above, the trend lines of two very interesting pieces of data averages: Active Inventory + Pending Sales, and Price Per Sq. Ft. These two datasets represent the supply and demand side, respectively, and reflect the impact of one on another on average. From 2010 to 2011, the Price Per Sq Ft trend line for Single Family Homes responded only slightly to a bigger change in Active Inventory trend line. This was largely attributable to the state of the local economy, the housing situation with large number of foreclosures, and sluggish growth in the local job market. In 2012, the local economic recovery gained steam and led to job growth, business growth, and a rapid revival in housing demand. Low interest rates brought hordes of buyers back into the market. Foreclosure inventories dwindled down to a trickle. For the first time in 3 years, the price per sq ft trend reacted sharply to the lack of supply, and huge pent up demand from buyers in 2012. Refer to the chart from Jan 2012 to Dec 2012. 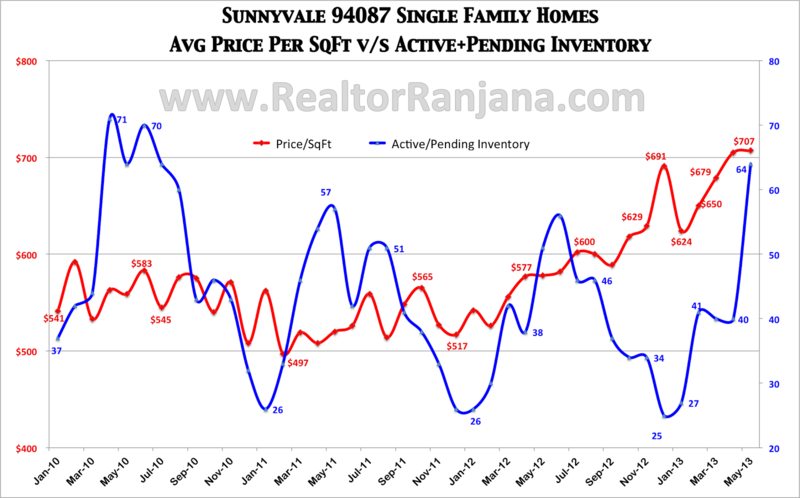 Sunnyvale’s 94087 areas saw a rapid climb in per sq ft price (red line) on average as inventory took a nosedive indicating a return of the price elasticity of demand with stronger correlations. As year 2013 moved on to May '13, we see the trend continuing to around $707 per sq ft compared to $691 in Dec '12 and $624 in Jan '13. The May '13 Price per Sq ft number is same as April while there is higher inventory now with 64 active/pending listings in May 2013, compared to just around 25 active/pending listings in Dec 2012. 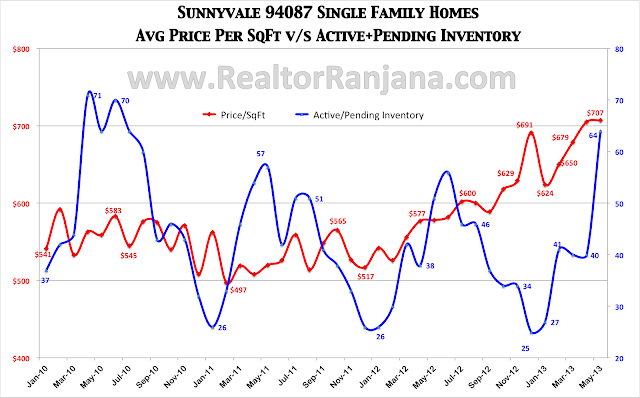 The demand for homes on sale is relatively higher in the part of Sunnyvale 94087 area where the schools are part of the Cupertino Schools. Nearby areas where top Sunnyvale schools such as Cherry Chase and Cumberland schools are located also saw rapid relative Per Sq Ft Price increases from their prior levels. This is a time when homeowners who have hitherto been waiting for the right time should recognize the potential for gains in a market seeing short supply of homes and high demand. What could dampen this trend? The current situation appears to have over heated the market and may possibly not stay for long as rapid & steep price rises are never long lasting. All it requires is a catalyst such as a tapering of the Quantitative Easing Policy of the Federal Reserve, leading to rapid rise in interest rates (which have been creeping up a lot these days), thereby pricing out some of the marginal competitive buyers from the market leading to a fall in the crazy demand and eventually some softening of the prices if not a fall. Homeowners waiting to sell thus far will put their homes on sale in coming months, given the high per sq. ft. prices, thus leading to better supply and more choices for buyers. As supply meets demand, or as interest rates move up, we can expect to see prices getting back to an equilibrium level. NOW is that great opportunity! for a free home market evaluation.